NEW YORK, NY--(Marketwire - Feb 6, 2012) - Nikon Inc. and Warner Music Group are uniting to host a star-studded residency at the upcoming South by Southwest® Music & Media Conference (SXSW®) in Austin, Texas. "The Warner Sound Captured by Nikon" will make its home at Austin's famed La Zona Rosa, with two days and three nights of showcase performances slated for March 13th through 15th. Artists from Atlantic Records, Warner Bros. Records and other WMG labels will appear live at these official SXSW showcases; all SXSW badge-holders are welcome. Among the artists will be such acclaimed acts as Santigold, B.o.B Wale & Meek Mill, fun., and Gary Clark, Jr. -- a full line-up will be announced shortly. WMG and Nikon are also teaming up to search for the next great music superstar via the "Your 1 Shot" contest. Bands/artists are invited to submit one live performance video to the "Your 1 Shot" contest site, located at http://www.talenthouse.com/nikon-perform-at-sxsw. One winner, courtesy of Nikon 1, will be selected by a stellar panel of music industry experts, including A&R executives from both Atlantic Records and Warner Bros. Records as well as guest artists from each label's prestigious roster. The winning artist or band will be brought in to Austin for a Wednesday, March 14th live performance at "The Warner Sound Captured by Nikon." In addition to earning a live performance, the "Your 1 Shot" winner will receive a new Nikon 1 J1 camera kit to capture their most memorable moments, travel and three nights' accommodation in Austin and VIP access to "The Warner Sound Captured by Nikon." One runner-up, as selected by Warner Music Group, will receive new Nikon photography equipment valued at up to $1,000. In addition, the "People's Choice" artist receiving the most votes online will receive Nikon equipment valued at up to $2,000. Artists' submissions will be accepted through Monday, February 20th at 10 a.m. PST, with online voting set to run from February 21st through February 27th. The "Your 1 Shot" winner is scheduled to be announced on Tuesday, March 6th. Warner Music Group will choose the winner(s) from all qualified submissions with special consideration for the top People's Choice voted entries. 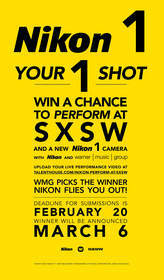 For Official Rules, Guidelines and Terms & Conditions please visit http://www.talenthouse.com/nikon-perform-at-sxsw. "The Warner Music Sound Captured by Nikon" is presented by Nikon, Inc., with additional sponsorship provided by TIGI Haircare, which notes that "TIGI's Bed Head is proud to be the official hair care partner of the Warner Sound Captured by Nikon, providing fans the opportunity to primp before they rock out at the show!" Follow @thewarnersound on Twitter (http://twitter.com/thewarnersound) for more announcements about WMG's SXSW® showcases at "The Warner Sound Captured by Nikon." ABOUT NIKON: Nikon, At the Heart of the Image™. Nikon Inc. is the world leader in digital imaging, precision optics and photo imaging technology and is globally recognized for setting new standards in product design and performance for its award-winning consumer and professional photographic equipment. Nikon Inc. distributes consumer and professional digital SLR cameras, NIKKOR optics, Speedlights and system accessories; Nikon COOLPIX® compact digital cameras; 35mm film SLR cameras; Nikon software products and Nikon sports and recreational optics as well as the new Nikon 1 advanced camera with interchangeable lens system. In 2011, production of NIKKOR lenses surpassed 65 million, creating a new milestone in Nikon's heritage of superior optics. For more information, dial (800) NIKON-US or visit http://www.nikonusa.com, which links all levels of photographers to the Web's most comprehensive photo learning and sharing communities. Connect with Nikon and other photographers on Facebook at http://www.facebook.com/nikon and get the latest news and information from Twitter by following @Nikon_USA. ABOUT WARNER MUSIC GROUP: With its broad roster of new stars and legendary artists, Warner Music Group is home to a collection of the best-known record labels in the music industry including Asylum, Atlantic, East West, Elektra, Nonesuch, Reprise, Rhino, Roadrunner, Rykodisc, Sire, Warner Bros. and Word, as well as Warner/Chappell Music, one of the world's leading music publishers, with a catalog of more than one million copyrights worldwide.